The carpus is one of the three main joints in the forelimb and is located just proximal to the paw. This type of orthotic device may be used in place of surgery, when surgical repair is not a possible or desired option, or it may be used at some distance after surgery if the procedure did not create the desired level of stability. In some cases, carpal orthoses are used as post-operative support to replace the traditional system of bandaging with a splint. A carpal orthosis will cross the carpal joint and extend above and below. In cases of mild angular changes, the support may end at the top of the paw, leaving the foot free to contact the ground. 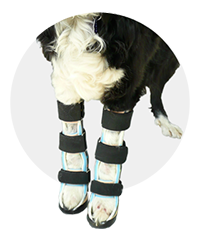 In more severe cases it is necessary to extend the support under the paw to properly support the joint and to spread out the pressure in the brace. An orthosis can be made to completely immobilize the joint, or to allow a controlled range of motion such as allowing flexion but limiting extension. of the digits or the carpal joint. It is important to note that to use a carpal orthosis in this situation the dog must have some control of the elbow and the shoulder joint in order to advance the lower part of the limb forward. A carpal orthosis can also be extended upwards to include a section that crosses the elbow if this joint also requires support. This combined brace is called a carpal-elbow orthosis.